One of the unexpected aspects of sharing a flat with someone else who is as enthusiastic about cooking as I am is that we set each other off. (There are almost always home-baked goods of some description in the flat – brownies, muffins, cookies – our other flatmate is loving it…and has co-incidentally taken up running) My flatmate decided to try home brewing, which inspired me to buy a yoghurt maker. I was making yoghurt on Wednesday morning before work, and when I came home my flatmate told me he’d been inspired to buy a steamer. I don’t know what I’ll do when the steamer arrives but I suspect making jam might happen. 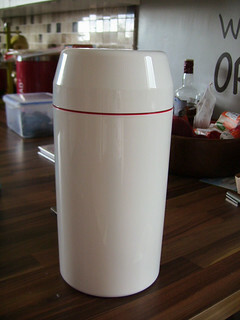 Anyway, I bought a yoghurt maker. 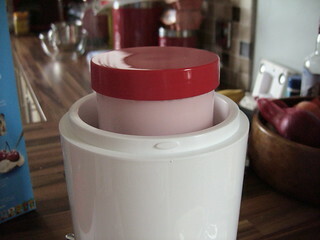 It’s not actually my first encounter with a yoghurt-maker, my mum had one when I was little, and I have fond memories of helping her make yoghurt. This is very different from my memory of that. 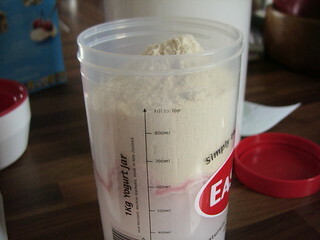 It’s considerably bigger for a start, and while her yoghurt maker involved four little tubs mine has one giant jar. I didn’t buy it because I thought it would save me money – it was all about the fun element – but given the sheer amount of yoghurt I get out of it, I think it might eventually break even. The other major difference is that with her version you kept a little yoghurt back to use as starter for next time but the ‘starter’ you get for this one is essentially powder. 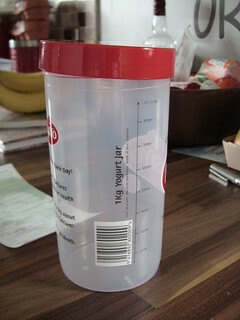 Anyway, it’s a ridiculously straight-forward process (I was expecting far more mess) where you half-fill the inner cylinder with cool water, add the starter mix, put the lid on and give it a good shake, top it up with more water and give it a further shake. 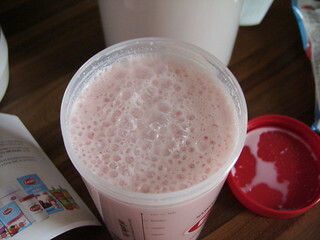 Resulting, in this case, in something that looked convincingly like frothy strawberry milk. 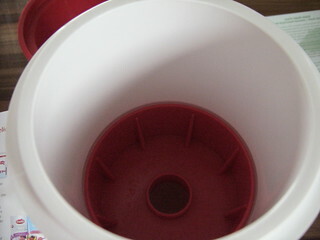 Then you fill the big cylinder with water up to the top of the baffle (that’s the red thing) and slot the inner cylinder inside it, close the lid and leave to set for 8-12 hours, after which you take it out and keep it in the fridge like normal yoghurt. I had my first try this morning with some blueberries – a tasty success!